Not cooking for a crowd this Thanksgiving? No problem, I’ve got you! 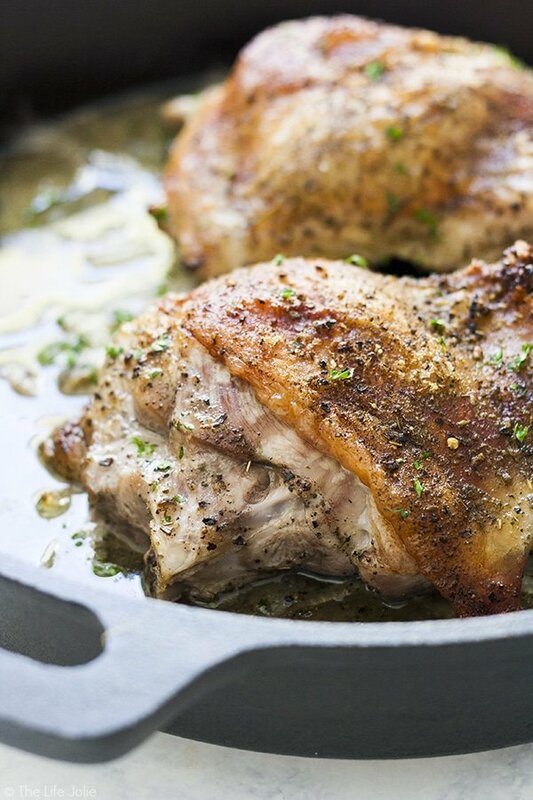 These Roast Turkey Thighs for Two are a mouthwatering, tender turkey dinner without the hassle of roasting a whole bird! My mom does this thing every Thanksgiving. If it’s not her year to host, she has a second Thanksgiving with just us kids because she likes to have lots of leftovers. So last year, instead of making a gigantic turkey like she usually does, she opted to make a smaller turkey and serve some roasted turkey thighs alongside it. Each turkey thigh was so flavorful and tender. We all went pretty crazy over them! It was a second-Thanksgiving win, if ever there was one. And now every year I start dreaming of those juicy turkey thighs all over again. So naturally, I did what I always do, I recreated them. My mom gave me some basic information and I got to work. A little less than an hour later, I was thrilled to open my oven to find a couple of the most juicy, tender turkey thighs ever. They had just the right amount of seasoning and the most crispy, crackly skin on top. This is special enough to make and serve for a holiday but simple enough for your usual Sunday or weeknight dinner. You can whip it up in an hour and it’s very easy to put together as well. Don’t you just love recipes that use simple ingredients that everyone has on hand? I left most of the ingredient amounts pretty open. I always season it to taste, although I do tend to have a lighter hand with the poultry seasoning. Everyone’s oven may vary, as will the size of your turkey thighs. I’d recommend temping each turkey thigh with a digital thermometer at 45 minutes. 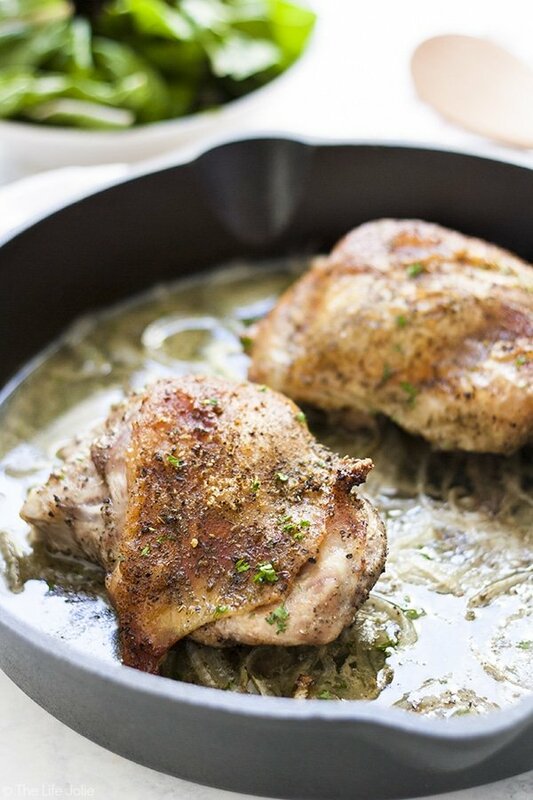 While these still taste great if they’re a little over cooked (gotta love dark meat!) they’re best when they temp out at 165 degrees. Let them rest for 10 minutes to redistribute the juices. Trust me on this! Can I make these for more than 2 people? Definitely. That’s part of the reason I left the basic ingredient amounts open. Just be sure to use the right size baking dish to accommodate the amount of turkey thighs you make so as not to overcrowd the pan. They’re also a great way to supplement and have extra dark meat available alongside a whole bird. How long do the leftovers last? These last 3-5 days covered in refrigerator. Can I you use a turkey breast instead? You can! You’ll want to roast it for about 20 minutes per pound but keep an eye on it so as not to overcook. You can also check out my recipe for smoked turkey breast if you have a smoker. What temperature are turkey thighs done? 165 degrees is a safe temperature for consuming poultry. How many turkey thighs per person? 1 per person is plenty if it’s the only meat. Not cooking for a crowd this Thanksgiving? No problem, I've got you! 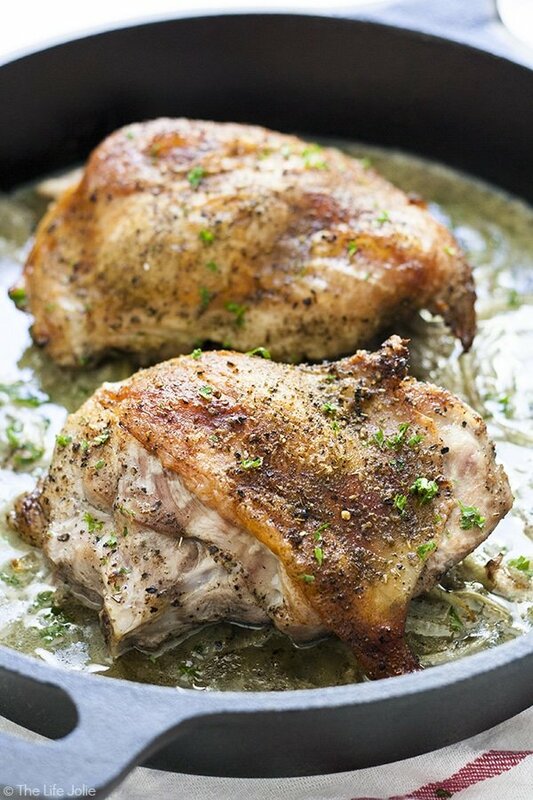 These Roast Turkey Thighs for Two are a mouthwatering, tender turkey dinner without the hassle of roasting a whole bird! Lightly drizzle a small amount of oil on the bottom of the pan. Spread the sliced onions into a layer on the bottom of the pan. Season the turkey thighs on each side with salt, pepper and poultry seasoning to taste (the poultry seasoning is strong so use a light hand with this). Cut each pat of butter into smaller cubes and place them on various spots all over the skin on each turkey thigh. Place the turkey thighs, skin side up, on top of the onions. Roast for 50 minutes-1 hour until they reach an internal temperature of 165 degrees. Remove them from the oven and let them rest in a foil tent for 10 minutes. Serve immediately. Looking for some other great cake mix hack recipes? September 30, 2016 at 1:01 am This dish looks delicious. Since I'm only cooking for one, it is helpful to have a recipe geared for 2 people cuz it gives me leftovers, too! Thanks for posting. November 23, 2016 at 8:14 pm I am also on my own! :) I needed a recipe that told me the basics for these - 400F/30 mins/165F.... So now I am armed with the right tools. I am going to make this tomorrow for my own private T-day feast with my dogs, with some only slight variations to the recipe. Thanks, Jessy! Can't wait! July 16, 2017 at 9:16 pm Thank you, Rhonda :) I'll tell you, if it were chicken thighs, I'd totally agree and likely have a shorter cooking time. 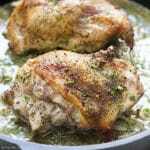 The turkey thighs that are available in my area are much larger and which is why the recipe has a longer cooking time. Different stores carry different products (every bird is different too) and every oven is a little different as well- mine actually has a hot spot in the very back which requires me to turn my pan half way through cooking. With that in mind, if you're nervous, start temping it earlier and if it gets to 165 (or even a tad less) pull it and let it rest for a couple minutes and then enjoy. I hope you love them! July 24, 2017 at 7:40 pm Made this dish tonight and it turned out perfectly! Delicious. Thanks for sharing it! July 24, 2017 at 8:50 pm I'm so glad you liked it :) Thanks for giving it a try! August 10, 2017 at 9:00 am Oh wow- Vickie, I think you may be a genius. This sounds amazing! Please let me know how they turn out! September 20, 2017 at 2:18 pm Does this recipe leave drippings to make a turkey gravy or no? Either way, I'm making it for sure! Thanks! September 20, 2017 at 4:15 pm Hi Sarah! There are a small amount of drippings, but probably not enough for gravy. It's probably be a good idea to have some turkey or chicken broth on hand. You can even pour all the onions from this recipe into the gravy as it cooks and either strain them through a sieve or or blend them into the gravy with a stick blender or regular blender for better flavor. Enjoy! November 23, 2018 at 8:44 am Fine recipe, thanks. Any alternatives for the remaining 1 1/2 cups or so of turkey/onion stock? December 27, 2018 at 8:48 am Before Christmas, I had to go to my local Publix store to get some items to make a few baked goods I was making for the holidays, a Tres Leches Cake to take to a Talmalada being held by one of my Mexican-American neighbors and a no bake cheesecake Key Lime Pie recipe for a family Christmas meal. I found some really good looking turkey necks and a package of two turkey thighs to make a post-Christmas day meal for just my mom and I. 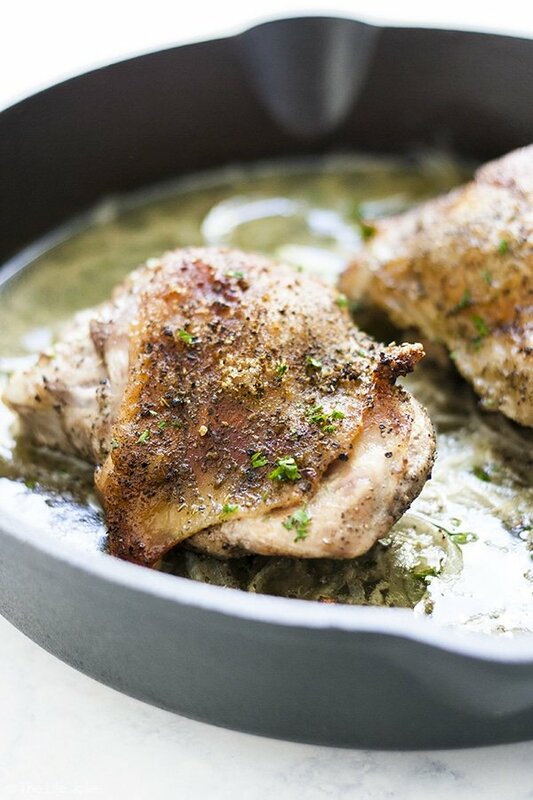 Not really having any idea as to how I was going to prepare the thighs, but as I now so often do, I did a search online for a recipe on a way to cook them and I found this one. I can say that it is a really easy and wonderful recipe for only making just a few parts of a turkey rather than an entire bird. I have much experience doing that both for family meals and in one of my "past lives" back in the day I was in the Coast Guard and later, doing things like working in either restaurants or for pure catering companies, or every so often, volunteering to help make holiday meals at "soup kitchens" and some of those big community Thanksgiving meal events that take place in many communities. I have made turkey in both the conventional means by baking and also do deep fry them every so often, but anymore, I really don't want to make a whole bird if I don't have to, in part because I am not eating like that much anymore--big huge meals with meat as the centerpiece. I now mostly eat foods that are a version of vegan in the name of weight loss and better health. 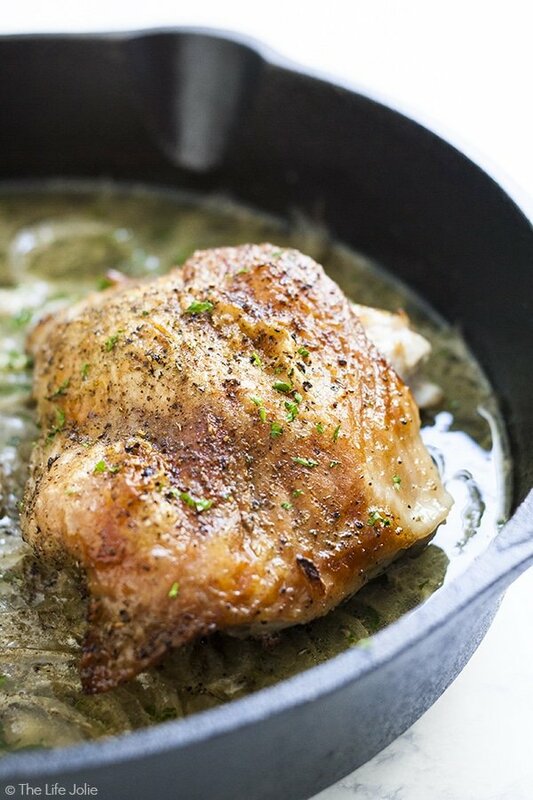 The prep work and cooking of the thighs as this recipe directs---could not be any easier and the results are really great. I would recommend this recipe to anyone looking to make such a meal and will surely be adding this recipe to my cooking repertoire to make again in the future. I did add some fresh made mashed potatoes, gravy and steamed asparagus to the meal I took over to my mom's place. The necks played a role in the making of the gravy and at least when taking part in cooking the holiday turkey bird at home since the time I was a kid many years ago, both of my grandmothers would make sure that I got to eat the turkey necks. They are one of my favorite parts of the bird. Final word about this great recipe---give it a try---you won't be sorry I am sure and you will be most pleased with the results. December 29, 2018 at 5:28 pm Thanks Michael- I'm so glad you liked it! I'm with you on the Turkey necks- great flavor for turkey and soup and the most tender and delicious meat!